One of the best things about summer is sitting outside in the sun with a cold drink. And if you are one of the lucky few with an outdoor room, then you should make the most of it! Now is the perfect time to fix the deck, clean the gutters, and repaint the porches because summer is here and your guests will soon be too! 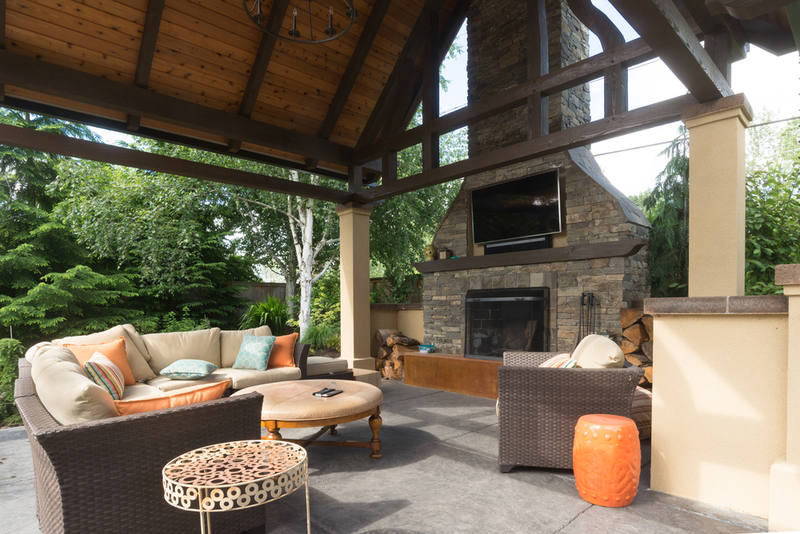 Below are 10 ways to turn your outdoor rooms into the ultimate outdoor entertainment area. We must warn you though, once you read these tips, you won’t have any more excuses not to invite people over! Juicy peaches, watermelons, and mangoes… how about laying out a summer spread with your favorite summer-themed dishes for your loved ones to ring in the solstice together? If dinner sounds like too much work, you can throw a summer happy hour instead. All you need is a little serving cart, and ask your friends to BYOB to make for the perfect party! Stock up on the best board games and turn your outdoor entertainment area into a family game room. Leave the lights on and use plenty of citronella candles around to keep the bugs away. If you are into prayer or meditation, there is no better place to do it than your outdoor room. Lay down a comfy rug with your favorite cushion and voila– instant meditation space. Or, you can take a nap if that’s what God is telling you! Want to make yoga a daily part of your routine? What better space is there to do it than outdoors with fresh air and sunshine? Outdoor baby shower, bridal shower, birthdays…there is always a reason to celebrate. Why not use your outdoor room to create special memories and take entertaining pictures that’ll last a lifetime? If you’ve been wanting to get in touch with your creative side, now is the time to set up an art aisle or potter’s wheel outside. There is no better place for inspiration than outside. Outdoor rooms can be a wonderful and safe area for kids to play in. For extra security, install porch screens or fiberglass panels. If you’ve got the green thumb and you love growing your own food, throw a dinner party using all the things you’ve grown. Show your friends where each item came from and impress them with your plant knowledge. If you really want to make the most out of your outdoor room, consider installing a mosquito proof panel or mesh around the entire space for a completely bug-free experience. Then you can really use it for anything you’d like! Ready to Make Use of Your Outdoor Room? Now that you know there are no limits to what you can do with your outdoor rooms, you’re ready to be the host of the summer. For more ideas to make the most out of your exterior spaces, visit our blog today!